Today was Day #6 of Chocolate and Music/Audio Theme Week. "Purple Rain" (Prince) was represented as a milk chocolate lavender almond center covered in milk chocolate. 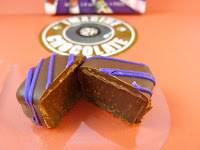 I couldn't taste any floral (lavender) or almond flavor, but it was a pleasant, fudgy chocolate decorated with purple icing. "Funky Cold Medina" was a 1989 rap hit performed by L.A. native, Tone Loc. 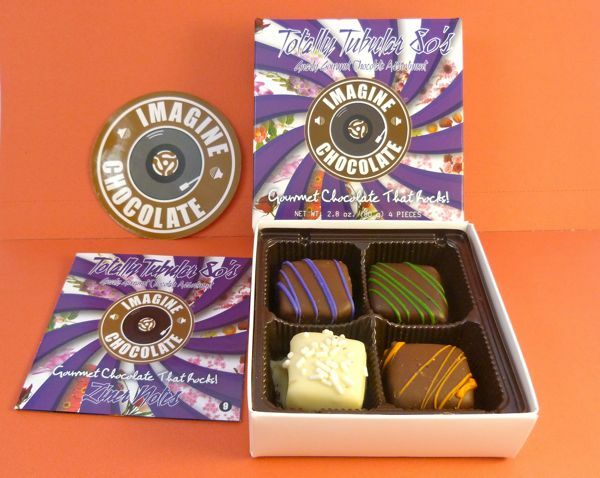 The song appeared as a dark mint chocolate almond center in dark chocolate in this assortment. The mint flavor was pleasant. 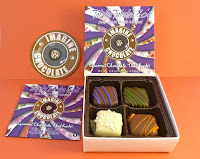 "Thriller" (a hit by Michael Jackson) was my favorite 80's inspired hit and chocolate in this collection. The pumpkin spiced milk chocolate center in milk chocolate was infused with authentic tasting spices (cinnamon, nutmeg). The fourth and final chocolate in this box was "White Wedding" (a reference to a ) Super creamy vanilla walnut (?) center in white chocolate, decorated with white sprinkles. If you like white chocolate, this one's for you. These chocolates were a bit heavy on the sweetness, preservatives and additives for me, but I loved the concept and packaging.